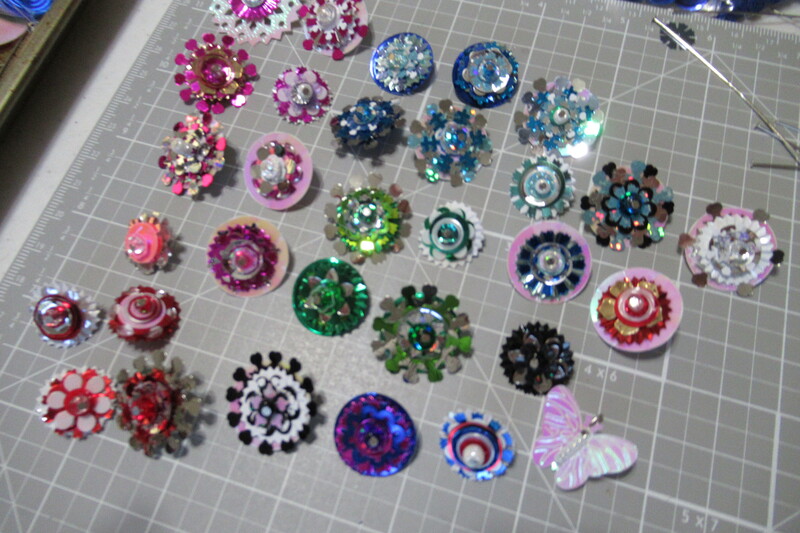 I have been having the time of my life the last couple of days making buttons , or charms , whatever you want to call them, out of sequins. 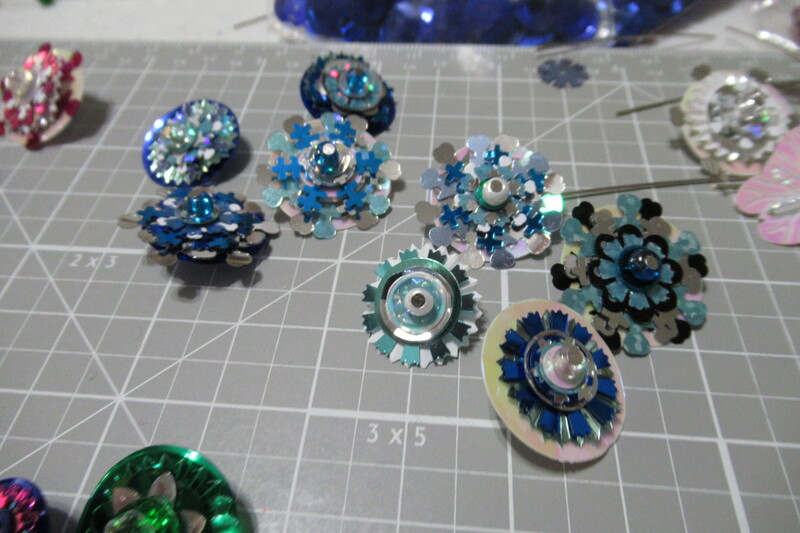 I put a small bead, usually an E bead at the end of a head pin, and then start layering the sequins. 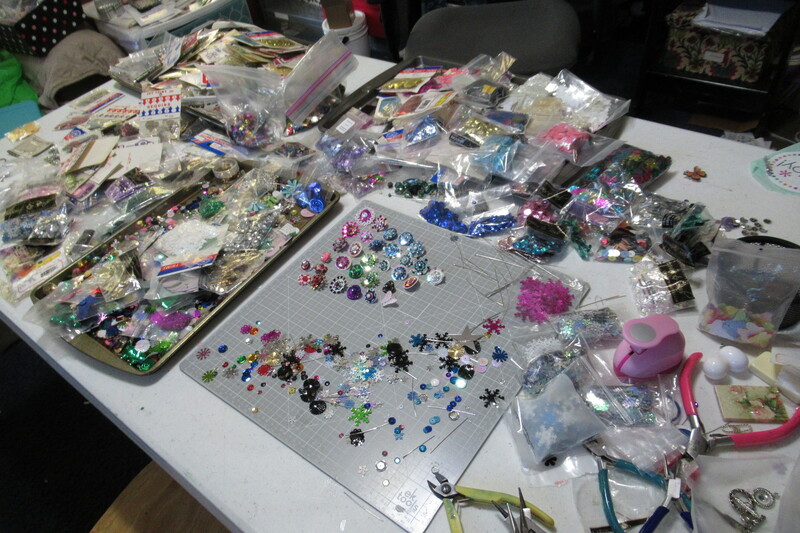 I have hundreds of colors and shapes and sizes to work with, so I came up with a lot of fun and pretty things. 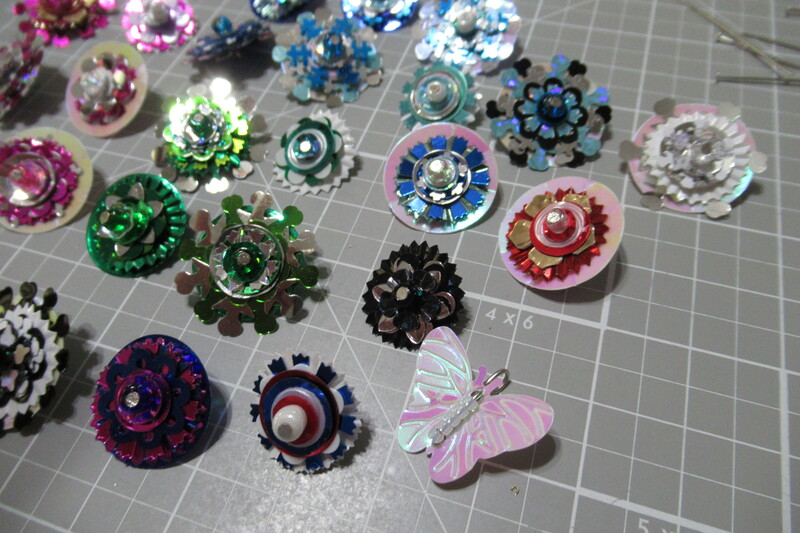 I listed a few in my shop already , and will have a bunch more sets to list the next few days. 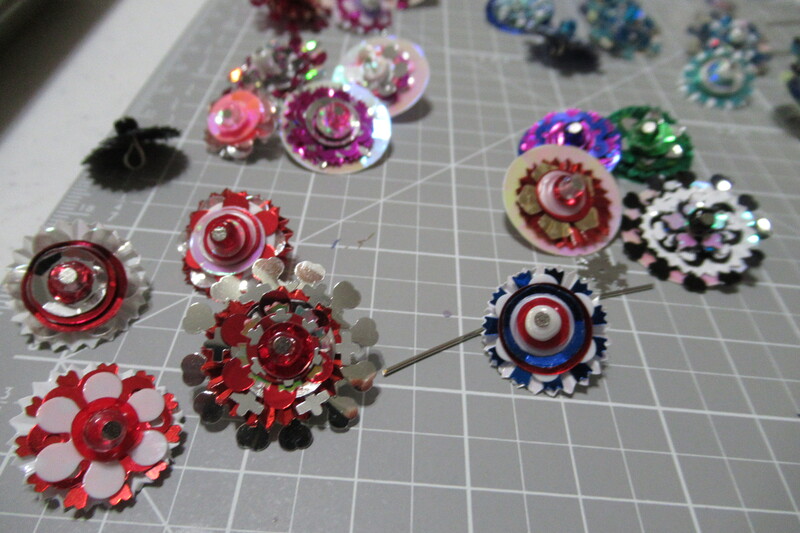 It is almost seven pm so I am posting this, and then I am done with sequins for tonight. I am pretty tired. 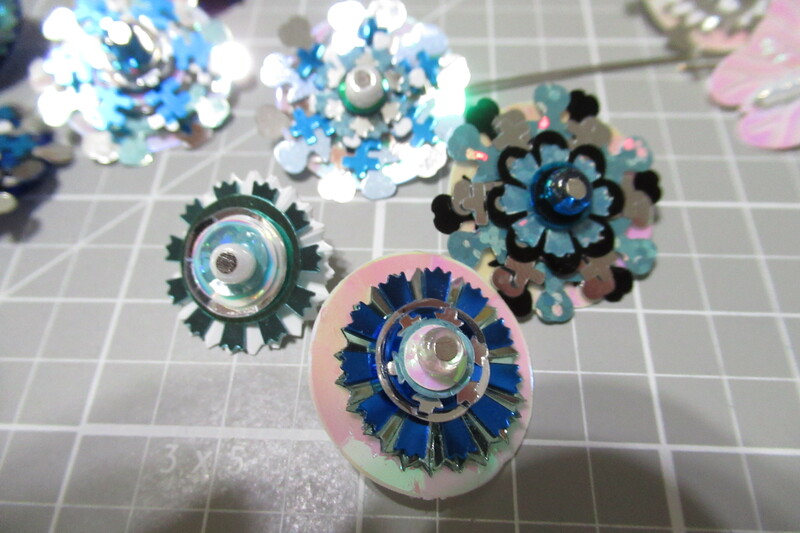 Some of the pieces I worked with are very tiny. So, here is what I did today !!! Whew. I am tired. 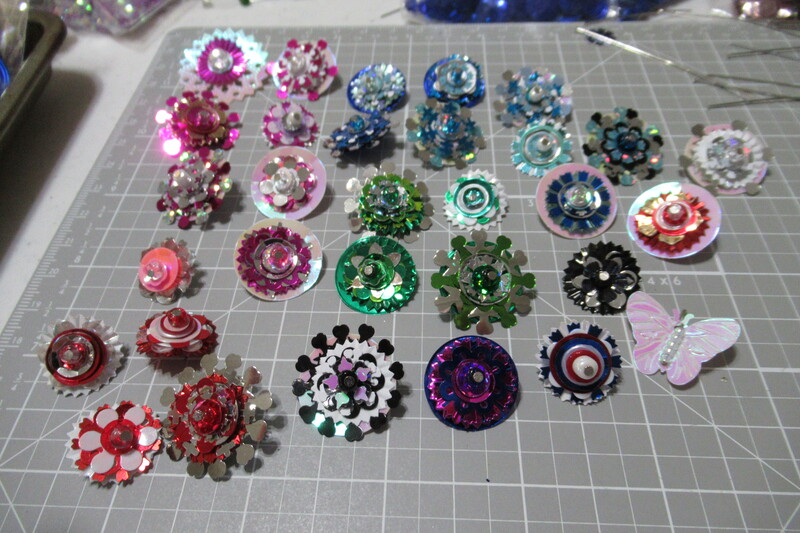 Its a lot of detail work and I have to loop the backs so my hands get tired after so many !!! This is my table tonight. 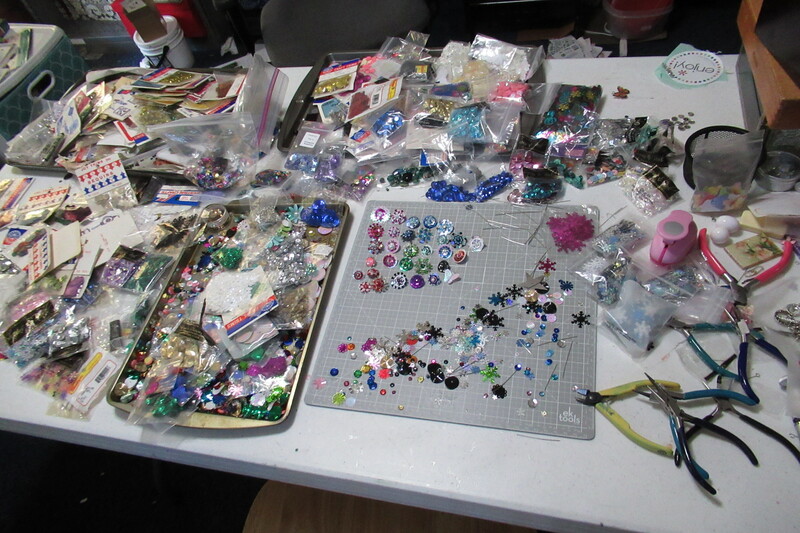 A corner of other stuff, the rest, sequins, keep in mind, this is a six foot table, lol !! 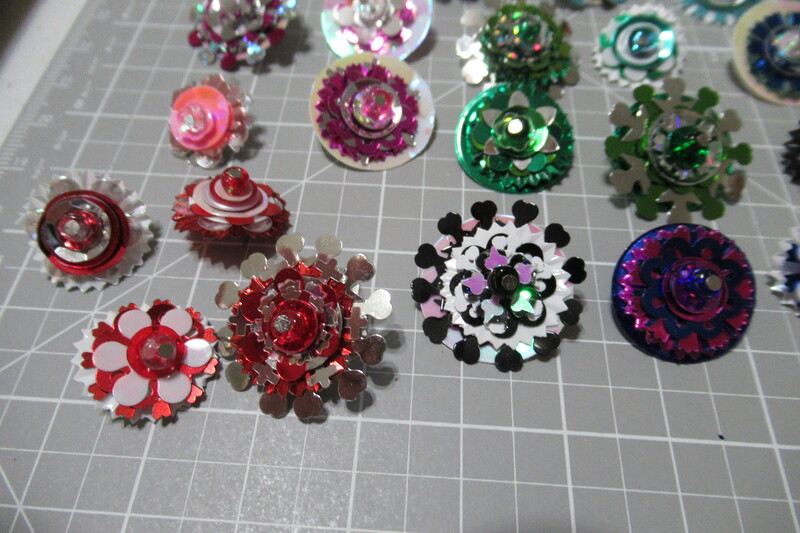 I do sell sequins in my Etsy shop and I also collect them. 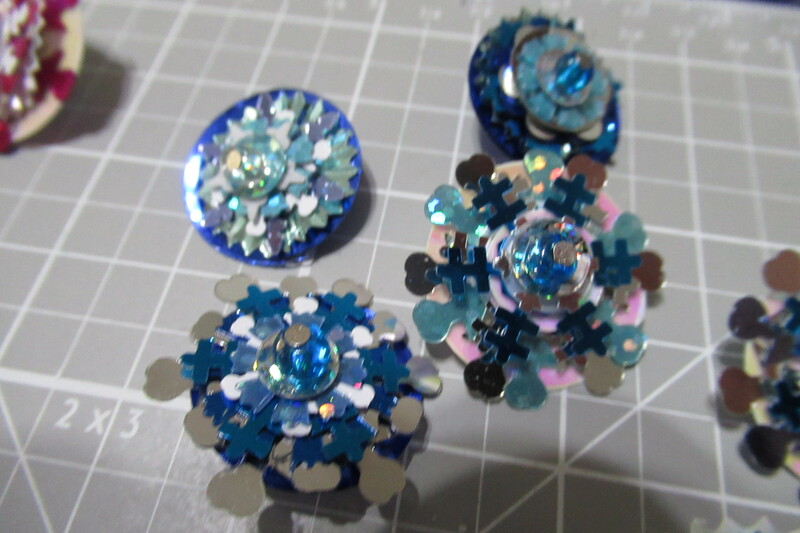 I plan to have kits for this buttons, plus beaded ornament kids by July, along with satin ornament kits with plenty of sequins in them. This is what I get to play with, but only a drop in the bucket of my personal collection. I am not even thinking about putting it all away, that will not be for a few days. 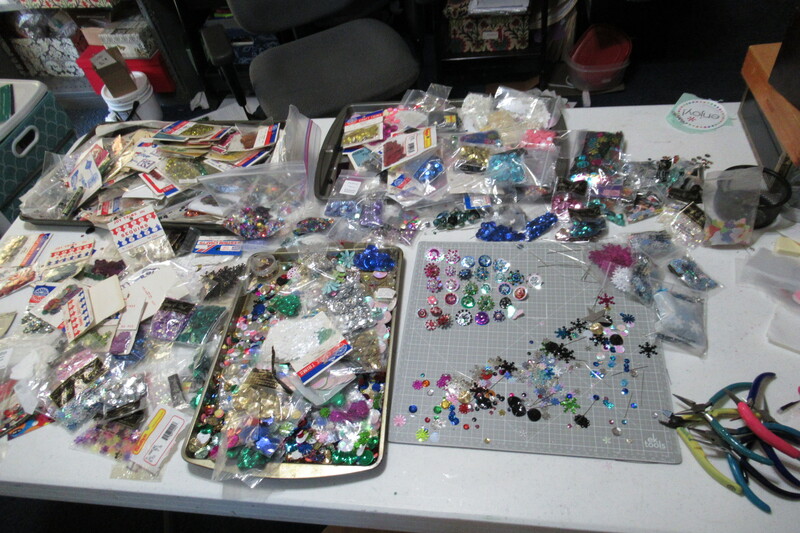 I still want to make a few more sets up, and then I will put the trays up and put away the bagged stuff. The loose stuff will stay on the tray for future projects. I have a shelf for trays where I can tuck it away safely. Well, that is it for tonight, I am done with them for now. My hubby is off all weekend, but it is supposed to rain so if we just hang around the house I may come in here for a while and let him have the tv to himself. He does not get much time to himself with working so much, so I like to give him some time to himself !! We might go run errands or do something fun part of the day hopefully !!! Just depends on how tired he is, he just worked a week straight, and over half were 12 hour shifts. He is tired !!! thanks so much for stopping by , I always appreciate it !!! Awesome! 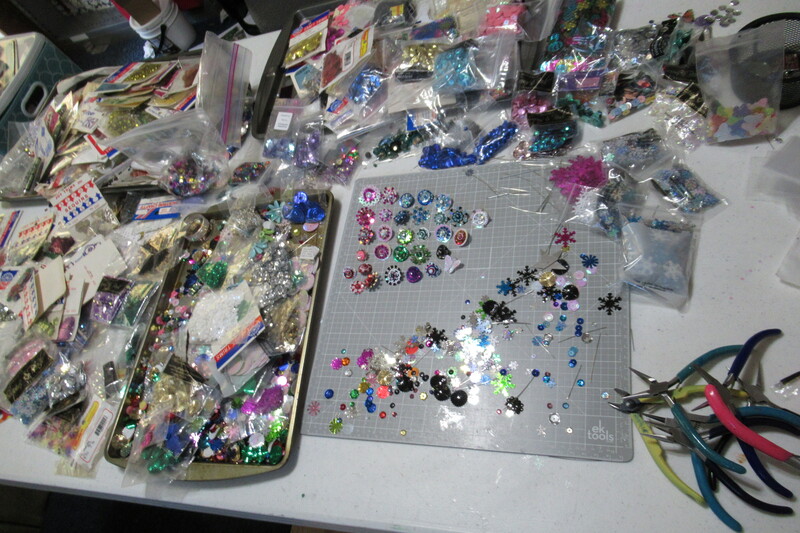 I can imagine the dedication in this project – sequins can be fiddley things and you want symmetry. Really lovely! Yes, you are so right, they are often a pain to get together !!! Thanks so much for stopping by !! These are super cool, love this idea! Thank you so much !! 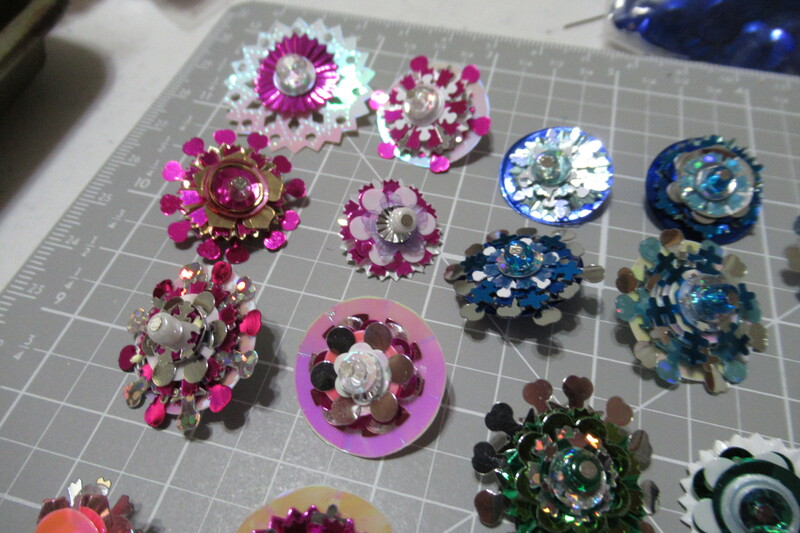 I love creating with sequins and it was just another fun way to use them !! !